The Catskills are an area of New York State, northwest of New York City and southwest of Albany, and normally just known as the Catskills. The area is said to be the birthplace of fly fishing, so go Fly Fishing Catskills. In August 2001 I was lucky enough to be making a business trip to Green Bay, Wisconsin via New York. During my research of that area, I discovered Fly Fishing Catskills. I learned that this was one of the greatest fly fishing areas in the world. I convinced my wife that I really should take the opportunity of dunking a fly or two. Once business was complete we took a domestic flight to LaGuardia Airport New York. This domestic hub overlooks the infamous Rikers Island prison complex. We hired a car for the week and drove through the Bronx, across the Hudson River, and past West Point Military Academy. The amount of traffic encountered prior to crossing the Hudson was phenomenal and not a pleasant experience. Once out of New York City the situation, as well as the scenery, changed dramatically. Not too far from Woodstock, famous for its legendary music festival in the ’60s, we arrived at our cabin, right beside Willowemoc Creek, a lovely trout stream. We checked into our cabin, which was really quite nice with everything you need for a short fishing holiday. I would have no hesitation recommending Creekside Cabins to anyone visiting the area. Outside, there was a BBQ and a quaint decked area around an old tree. Over the years, fly-fisherman had adorned the tree with flies by attaching the hook into the tree bark. What a great place, absolutely no signal for a mobile phone and a short walk through a wood down to the creek. One of the most memorable features of the cabin was ‘Eddie the Eagle’. Eddie, a ginger cat, often attempted to get into the cabin, in so doing he spreadeagled himself on the fly screen of the back door waiting to be let in. 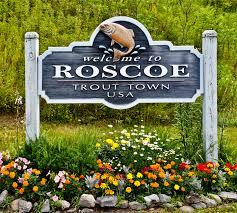 We had to travel to Roscoe to arrange a New York State Licence and to brush up on the regulations for fishing in the area. 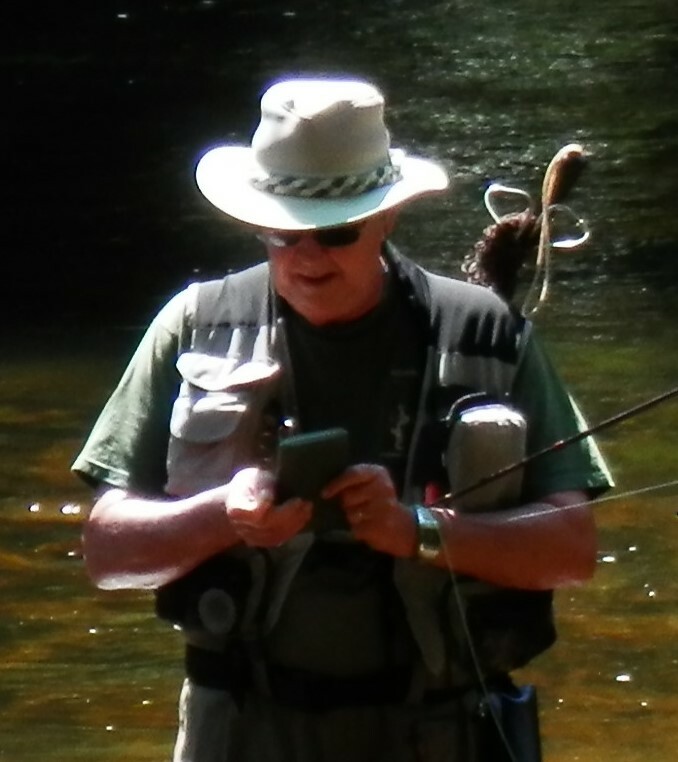 Suitably armed with official permission and a fishing map of the Catskills, it was time to set up the rod and start fishing and what an experience it was. This famous pool just had to be fished, but even better was the sight of beavers pushing logs across the pool. Many of the rivers have ‘kill’ in the name, this comes from the Dutch and means creek or river. 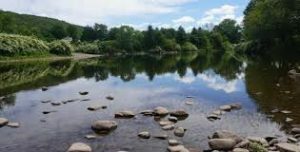 The Beaverkill is toasted as the birthplace of American Dry Fly Fishing and was the fishing revier of the famous Lee Wulff, inventor of one of my favourite flies, the Grey Wulff. The Wulff family still have a Fly Fishing School at Livingston Manor, Wulf School of Fly Fishing. This is a great fly fishing stream, especially at dawn and dusk. The Catskill Fly Fishing Center and Museum situated just along from Creekside Cabins. If you intend Fly Fishing in the Catskills, you really must visit the Fly Fishing Museum. 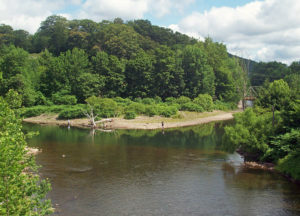 One of the most memorable days was a canoe trip down the East Branch of the Delaware River. We hired a canoe for the day from Al’s Sports Store and set off down the Delaware River. The first amazing sight was Downsville covered bridge, well worth a visit. Most of the time we were able to paddle gently down-river, wondering at the diverse wildlife on display. Whilst traversing one pool I noticed a Beaver Lodge and decided to take a close look. it was an amazing construction! Not so happy about our intrusion was the Beaver, who came up, looked at us in an irate manner and noisily chased us off, flat tail beating the water. Anyone who believes Beavers are small cuddly creatures needs to see one in the wilds of the Catskills, they appear to be enormous and not to be trifled with, especially when you are in a flimsy canoe. One of the highlights of the whole trip was about a half-way down river. We stopped for lunch where the river was a little narrower and flowing over a rocky ledge. We lifted the canoe clear of the water and I scanned the river and saw an overhanging tree which looked to be an ideal lie for a fish. I collected my rod from the canoe and dropped my fly just upstream. Two seconds later the water exploded and I was into the biggest fish of the trip. That’s the way fly fishing should be, one cast, one fish! The canoe trip was fabulous, such an experience, but not all plain paddling downstream. As the river progressed, there were weir-like sections of rapids, not very fast or deep but it was necessary to get out and assist the canoe to negotiate the small boulders. All great fun! Many other fish were caught that week, most were released but two were taken for our evening meal. We converted the BBQ at the cabin into a smoker and had a wonderful meal on the decking, beside the Fly Tree. I have very fond memories of the Catskills and if you get a chance, you really must go, if only to experience the magic display of fireflies at night, now there is an opportunity for an inventive fly tier! Before leaving, I attached my most successful fly to the Fly Tree, hoping that perhaps someone else would use it. We travelled back to the Big Apple, and whilst waiting for our flight from JFK Airport, did a sightseeing trip of New York, during which we passed and marvelled at the Twin Towers of the World Trade Center. Who would have known what was to happen on 9/11 only a few weeks later? A New York State Fishing Licence can be obtained from most Fishing Outfitters, who will also provide, or sell you a fishing map of the area.